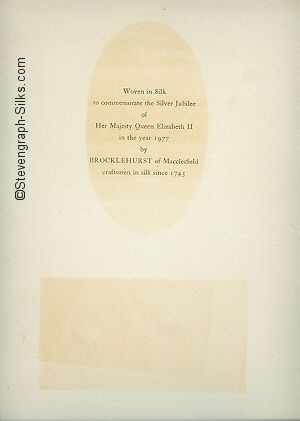 Woven in Silk to commemorate the Silver Jubilee of Her Majesty Queen Elizabeth II in the year 1977 by BROCKLEHURST of Macclesfield, craftsmen in silk since 1745. 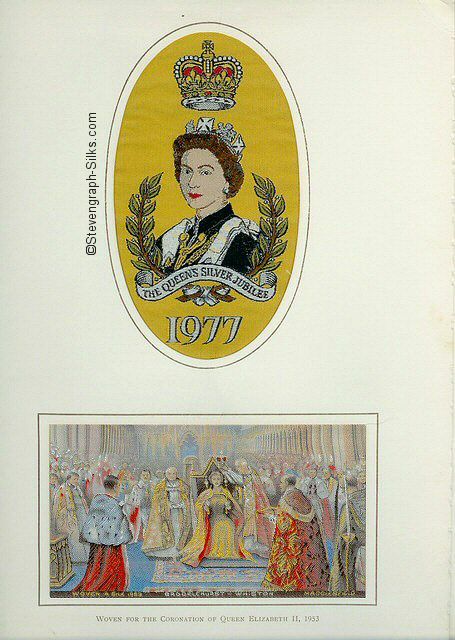 From 1969-1976 no pictures were produced, but in 1977, to mark the Queen's Silver Jubilee, two were sold at the same time. The new one could be bought separately [obk84 on this site]. It could also be bought double mounted [as above] on the same mount as the Coronation, which had previously been issued in 1953. The Jubilee silk is the only one woven with more than six colours in it. Variations exist in the single silk picture, with the background known to have been woven in gold or pale blue. The originally double mounted editions [above] feature the gold version only. At this time, whilst some of the earlier pictures were still available from BWA, others were already out of stock. The Silver Jubilee could be purchased for �50 and the double mounted issue of the Coronation and Silver Jubilee was available for �.50. The double mounted issue was available only on request, and was supplied 'to order'. Estimates vary regarding the actual number sold - some say between twelve and twenty. Whatever the truth may be, they are very rare.